We have had a lovely week in Busselton staying in a time share unit. We will be returning to the camper trailer from now until we get home. The Capes region of Western Australia is a lovely spot to be. 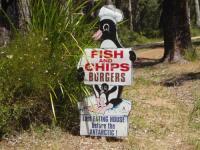 We have done quite a few day trips and visited a few Margaret River Wineries and seen both the lighthouses - Cape Naturaliste and Cape Leeuwin. 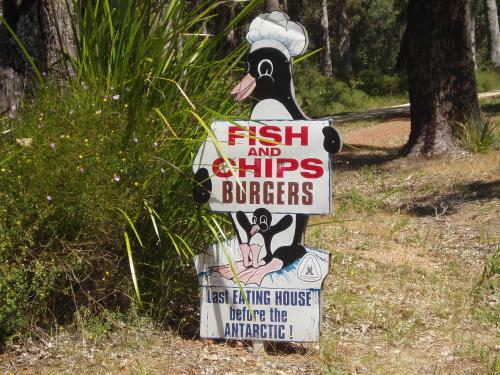 The sign here is from a cafe onthe Southern Ocean beach at Augusta and it rather tickled my sense of humour. We enjoyed the caves in theis area and the spectacular coastline. The crafts were excellent, though quite expensive. We have however done a bit of Christmas shopping. Looking forward to seeing a bit more of the south west before we leave WA.